Archimedes was, arguably, the world’s greatest scientist – certainly the greatest scientist of the classical age. He was a mathematician, physicist, astronomer, engineer, inventor, and weapons-designer. As we’ll see, he was a man who was both of his time and far ahead of his time. Artists’ ideas of Archimedes. We do not know what he really looked like. Archimedes was born in the Greek city-state of Syracuse on the island of Sicily in approximately 287 BC. His father, Phidias, was an astronomer. Archimedes may also have been related to Hiero II, King of Syracuse. • invented the sciences of mechanics and hydrostatics. • discovered the laws of levers and pulleys, which allow us to move heavy objects using small forces. • invented one of the most fundamental concepts of physics – the center of gravity. • calculated pi to the most precise value known. His upper limit for pi was the fraction 22⁄7. This value was still in use in the late 20th century, until electronic calculators finally laid it to rest. • discovered and mathematically proved the formulas for the volume and surface area of a sphere. • showed how exponents could be used to write bigger numbers than had ever been thought of before. • proved that to multiply numbers written as exponents, the exponents should be added together. • infuriated mathematicians who tried to replicate his discoveries 18 centuries later – they could not understand how Archimedes had achieved his results. • directly inspired Galileo Galilei and Isaac Newton to investigate the mathematics of motion. Archimedes’ surviving works (tragically, many have been lost) finally made it into print in 1544. Leonardo da Vinci was lucky enough to see some of the hand-copied works of Archimedes before they were eventually printed. • was one of the world’s first mathematical physicists, applying his advanced mathematics to the physical world. • was the first person to apply lessons from physics – such as the law of the lever – to solve problems in pure mathematics. • invented war machines such as a highly accurate catapult that stopped the Romans conquering Syracuse for years. He may have done this by understanding the mathematics of projectile trajectory. • became famous throughout the ancient world for his brilliant mind – so famous that we cannot be sure that everything he is said to have done is true. 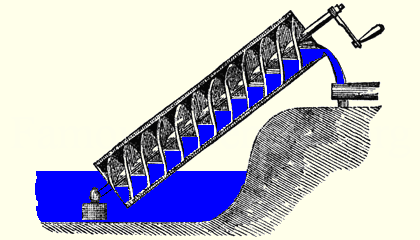 One example of this, the Archimedean screw or cochlias is discussed below. • inspired what we now believe are myths including a mirror system to burn attacking ships using the sun’s rays, and jumping from his bath, then running naked through the streets of Syracuse shouting ‘Eureka’ meaning ‘I’ve found it’ after realizing how he could prove whether the king’s gold crown had silver in it. The ancient Greeks were the first people to do real science and recognize science as a discipline to pursue for its own sake. Although other cultures had made scientific discoveries, these were made for thoroughly practical reasons, such as how to build stronger temples or predict when the heavens would be right for planting crops or getting married. Today, we would describe the Ancient Greeks’ work as blue skies scientific research. They investigated the world for the sheer pleasure of adding to their knowledge. They studied geometry for its logic and its beauty. With no practical purpose in mind, Democritus proposed that all matter was made of tiny particles called atoms and that these atoms could not be split into smaller particles. He produced logical arguments for his idea. Archimedes spent most of his life in Syracuse. As a young man he spent time in the Egyptian city of Alexandria, where Alexander the Great’s successor, Ptolemy Lagides, had built the world’s greatest library. The Library of Alexandria, with its meeting rooms and lecture halls, had become the focal point for scholars in the ancient world. Some of Archimedes’ work is preserved in copies of the letters he sent from Syracuse to his friend Eratosthenes. Eratosthenes was in charge of the Library of Alexandria, and was no mean scientist himself. He was the first person to calculate the size of our planet accurately. 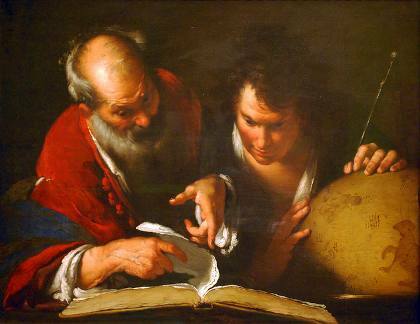 An artist’s view of Archimedes’ friend Eratosthenes teaching in the Library of Alexandria. Of course, the books in the library would have been scrolls, rather than the codex style shown here. Immersed in the scientific culture of Ancient Greece, Archimedes blossomed into one of the finest minds our world has known. He was the Einstein of his time, or perhaps we should say that Einstein was the Archimedes of his time. Two thousand years after Archimedes’ time, during the Renaissance and 1600s, mathematicians looked again at his work. They knew Archimedes’ results were correct, but they couldn’t figure out how the great man had found them. Archimedes was very frustrating, because he gave clues, but did not reveal his full methods. In truth, Archimedes enjoyed teasing other mathematicians. He would tell them the correct answer to problems, then see if they could solve the problems for themselves. The book was a Christian prayer book written in the thirteenth century, when Constantinople was the last outpost of the Roman Empire. Within Constantinople’s walls were stored many of the great works of Ancient Greece. The book Heiberg found is now called the Archimedes Palimpsest. Heiberg discovered that the book’s prayers had been written on top of mathematics. The monk who wrote the prayers had tried to remove the original mathematical work; only faint traces of it remained. It turned out that the traces of mathematics were actually copies of Archimedes’ work – a momentous discovery. The Archimedes text had been copied in the 10th century. 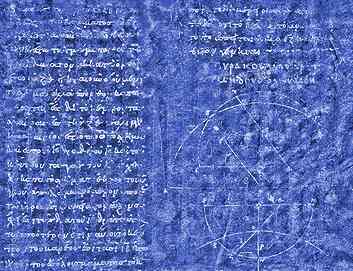 A false color view of a page from the Archimedes Palimpsest, showing some of the recovered mathematics. Courtesy of The Walters Museum. The book contained seven treatises from Archimedes including The Method, which had been lost for many centuries. And so by reading The Method, twentieth century mathematicians learned just how far ahead of his time Archimedes was and the techniques he used to solve problems. He summed series; he used his discoveries in physics – the law of the lever, and how to find centers of gravity – to discover new theorems in pure mathematics; and he used infinitesimals to do work as close to integral calculus as anyone would get for 1,800 years. The water screw is rather like a corkscrew within an empty tube. It can pull water up from a river, lake, or well. Traditionally, the water screw or cochlias was said to have been invented by Archimedes. Stephanie Dalley of the University of Oxford has discovered Assyrian cuneiform writings from about 680 BC titled The Palace without a Rival describing what sounds like a water screw irrigating gardens in the city of Nineveh in Mesopotamia (Iraq). She believes these gardens were actually the famous Hanging Gardens once associated with Babylon. In Mesopotamian cultures inventors remained anonymous or their inventions were attributed to the king who paid for the work. 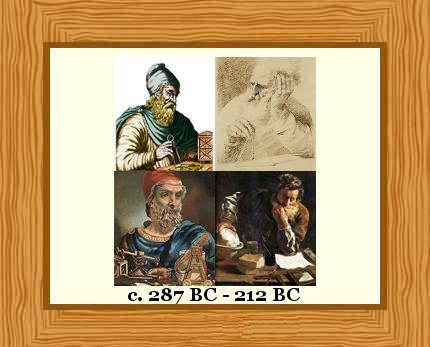 In Greek culture inventions were attributed to the inventor. the device was forgotten after Nineveh was conquered by the Babylonians and Archimedes invented it from scratch. the device could have reached Egypt, which was under Assyrian rule in 680 BC. Archimedes may have seen it operating there four centuries years later, when Egypt was under Greek rule. It is possible he greatly improved the water screw, making it a user-friendly, geared device rather than one turned by hauling on chains. With gears, the water screw could have been used by poorer farmers rather than only those wealthy enough to afford work-gangs to pull on chains. for no more reason than Archimedes was antiquity’s greatest genius. King Hiero II had given gold to a craftsman to make him a crown. The crown he got back weighed the same as the gold given to the craftsman, but King Hiero was suspicious. He thought the craftsman had stolen some gold, replacing it with silver in the crown. He couldn’t be sure, so he sent for Archimedes and explained the problem to him. It was known that gold is denser than silver, so a one centimeter cube of gold would weigh more than a one centimeter cube of silver. 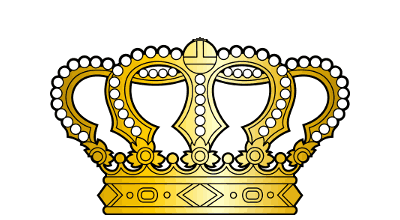 The problem was that the crown was irregularly shaped, so although its weight was known, its volume wasn’t. Archimedes is believed to have measured how much the level of water in a cup was raised by sinking, for example, one kilogram of gold in it, and comparing this with one kilogram of silver. If we did this measurement using modern equipment, we would find the 1 kg of gold would raise the water level by 51.8 ml and the 1 kg of silver by 95.3 ml. So, if King Hiero’s crown weighed 1 kg, and it raised the water level by 52 ml or so, then the crown would be pure gold. If the water level rose more than this, then some of the gold had been replaced by silver. Archimedes found that the crown was a mixture of gold and silver, which was bad news for King Hiero, and even worse news for the King’s craftsman! Archimedes is supposed to have had the idea of how to solve King Hiero’s problem when he was taking a bath, noticing the water level moving as he lowered and raised himself. He was so excited that he leaped up and ran naked through the streets of Syracuse shouting ‘Eureka,’ meaning, ‘I’ve found it.’ It seems that even thousands of years ago, scientists had a reputation for being a little crazy! π is the number you get when you divide the circumference of a circle by its diameter. To calculate a circle’s area, or circumference, you need to know π.
Archimedes was intensely interested in calculating the mathematical properties of curved solids, such as cylinders, spheres and cones. To do this, he wanted to learn more about π. We now know that π is an irrational number: 3.14159265358979… the numbers after the decimal point follow no pattern and never end, so an exact value can never be found. Archimedes knew that the circumference of a circle equals 2 × π × r, where r is the circle’s radius. Here is how Archimedes calculated the circumference of a circle of known radius, and hence found π. His method is called the method of exhaustion, developed rigorously about a century earlier by one of Archimedes’ heroes, Eudoxus of Cnidus. 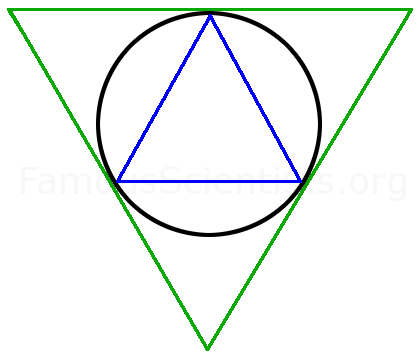 Archimedes imagined a circle, and in his mind drew an equilateral triangle inside it, with each point of the triangle touching the circle. Outside the circle, he drew another equilateral triangle, with each side touching the circle. 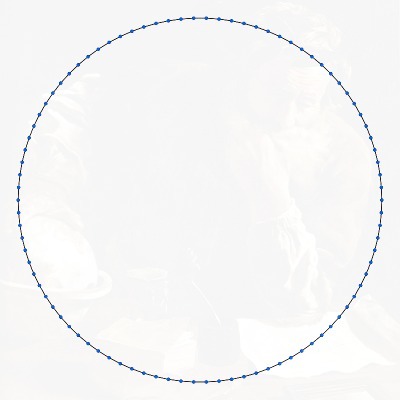 Archimedes drew a mental image of a circle bounded by triangles. He could easily calculate the perimeter of each triangle, and therefore he knew the circle’s circumference was greater than the inside triangle and smaller than the outside triangle. 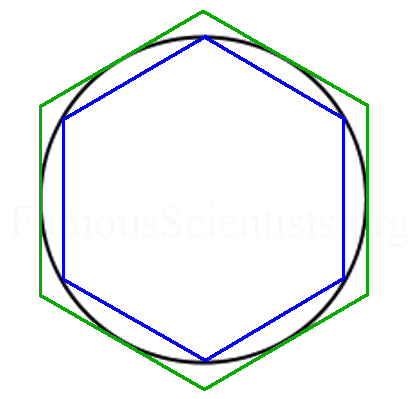 Then, using a formula he had devised to calculate the perimeter of a polygon with double the number of sides of the previous polygon, he repeated his calculation, this time for a circle with a regular hexagon inside it, and a regular hexagon outside it. The hexagons enclosed the circle more closely than the triangles had and their perimeters were nearer to the true circumference of the circle. Archimedes drew a mental image of a circle bounded by regular hexagons. In this way Archimedes tightened the limits for the maximum and minimum circumference of the circle. Next, he imagined a circle between two 12-sided regular polygons, then two 24-sided regular polygons, then two 48-sided regular polygons. Finally, Archimedes calculated the circumference of a 96-sided regular polygon inside his circle, and a 96-sided regular polygon outside his circle. A 96-sided regular polygon looks the same as a circle unless you zoom in with high magnification. Is this a polygon, or a circle? Above is a 90-sided polygon. It has fewer sides than the 96-sided polygon Archimedes used for his calculation. Using the 96-sided polygon, Archimedes found that π was greater than the fraction 25344⁄8069, and less than the fraction 29376⁄9347. For the world at large, he simplified these numbers, losing a tiny amount of precision to say π was bigger than 310⁄71 and smaller than 31⁄7. 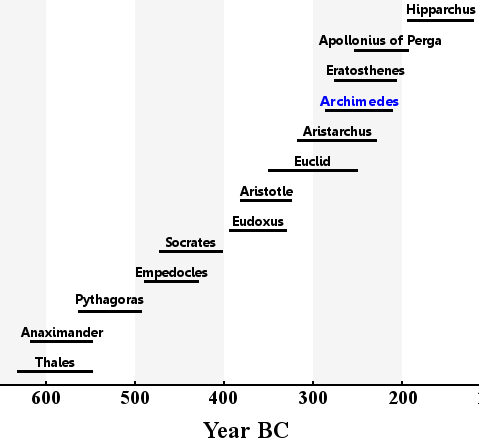 If we average Archimedes’ best upper and lower limits for π, we get it to be 3.141868115 to nine decimal places. Archimedes’ value of π differs from the value on your calculator by less than 1 part in 10,000. In fact, Archimedes’ value of π of 31⁄7 (this is often written as 22⁄7) was used extensively until it entered a graceful retirement in our digital age. Remember that Archimedes did not actually make measurements for his calculations. They could never have been precise enough. He used pure mind-power to calculate the areas involved in each situation. Archimedes saw his proof of the volume of a sphere as his greatest personal achievement. His work is remarkable for its similarity to modern calculus. Archimedes gave instructions that his proof should be remembered on his gravestone. Read about how Archimedes invented the Beast Number, a number so enormous that the visible universe isn’t big enough to write it out in full. And all this because he was fed up of people saying that it was impossible to calculate how many grains of sand there were on a beach. Archimedes died during the conquest of Syracuse in 212 BC when he was killed by a Roman soldier. He was buried in a tomb on which was carved a sphere within a cylinder. This was his wish, because he believed his greatest achievement was finding the formula for the volume of a sphere. Many years later, Cicero, the Roman Governor of Sicily, went looking for the tomb of Archimedes. He found that it had become overgrown with weeds and bushes, which he ordered to be cleared. Today we do not know where Archimedes’ tomb is – it has been lost, probably forever. Much of his work has also been lost forever, but what we know of it leaves us in awe of his achievements. Archimedes was a great practical scientist, but above all, he lived up to the Greek ethos of carrying out blue sky research. He worked on mathematical problems for the sake of mathematics itself, not to solve practical problems. Funnily enough, all of his discoveries in mathematics ultimately did prove to be useful both practically as well as mathematically. Democritus lived in Ancient Greece. He was born in about 460 BC and died in about 370 BC. Eratosthenes lived in Ancient Greece. He was born in about 276 BC and died in about 194 BC. Cicero lived in the Roman Empire. He was born January 3, 106 BC and died December 7, 43 BC. Leonardo da Vinci lived in Italy. He was born April 15, 1452 and died May 2 , 1519. Galileo Galilei lived in Italy. He was born February 15, 1564 and died January 8, 1642. Isaac Newton lived in England. He was born December 25, 1642 and died March 20, 1727. Albert Einstein lived in Switzerland, Germany and America. He was born March 14, 1879 and died April 18, 1955. "Archimedes." Famous Scientists. famousscientists.org. 1 Jul. 2014. Web. This article was so helpful for the report i had to do on Archimedes for algebra 1, he made so made so many very much needed discoveries in mathematics. He truly was brilliant but unfortunately doesn’t get enough credit for it. Thank you for all the information :)it was really helpful! sooooooo helpful for my report!!!!!!!! Thanks!!!! !